Rottweilers look tough, but sometimes looks are deceiving. Living with a rottweiler means having a loyal, protective and sometimes fierce guard dog who also loves to cuddle on your lap and clown around your house. Intimidating and vigilant against strangers, with their people rottweilers can be big babies who snuggle, drool and fart with utter abandon. Rottweilers drool and fart—a lot. After they eat or drink, they tend to slobber; you might notice saliva dribbling onto your feet or the floor. This tendency is especially prevalent in big males and females who have large heads and saggy jowls. Another aspect of life with a Rottweiler is gas—the kind that can clear a room in seconds. Many dog foods make the problem worse by using corn, grains and ingredients high in fiber. Home-cooked meals made up mostly of meat often lessen this problem, but check with your vet before changing your dog's diet. 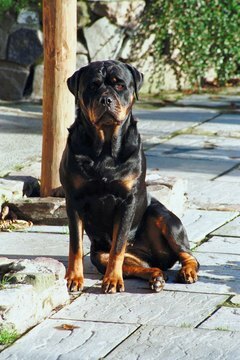 As a breed, rottweilers have gotten a bad reputation, often because people have bred them to be overly aggressive or haven't socialized and trained them. You do have to carefully choose a dog who has a good temperament, but when you find him, you might be surprised how affectionate and funny he is. Rottweilers love staying in physical contact with their people and sometimes mistake themselves for lap dogs. They can also be comics, entertaining you with their antics and goofy nature. Rottweilers can be excellent workers. They're smart, strong and persistent dogs who enjoy performing tasks and facing challenges. You can find them in an array of professions, working as farm, police, search and rescue, service and therapy, and tracking dogs. If those jobs aren't a possibility for you and your rottweiler, you both might enjoy agility courses, obedience competitions, advanced training or Schutzhund, a sport that focuses on obedience, protection and tracking. 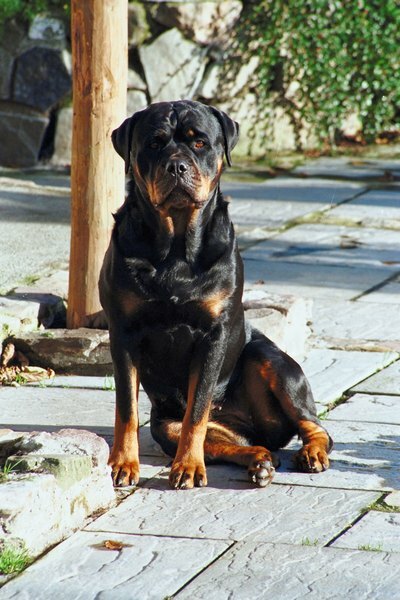 People who live with Rottweilers fight against negative stereotypes, misinformation, legislation that limits or bans these dogs, and insurance policies that don't cover them. Unfortunately, without firm leadership and solid training, rottweilers can become vicious and dangerous. Still, people loyal to this breed have proven that with the necessary socialization, skills and guidance, these dogs make valued family members and contributors to society. Groups such as the American Rottweiler Club (amrottclub.org) offer support and information for anyone who loves these dogs and wants to advocate for them. United Schutzhund Clubs of America: Schutzhund and the German Shepherd Dog: What is Schutzhund? Can Kittens Die From Flea Shampoo? Do You Have to Get a Parakeet a Companion?